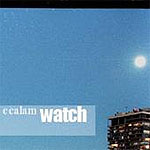 'Watch' by ccalam is a slice of post-psychedelic ambient music that might just appeal to the kind of people who enjoy the stoned Michael Moorcock hero in the space capsule, thinking about his life and times. Not quite Bowie's Major Tom but more of an introspective space cowboy version of Nick Drake perhaps, who probably took a puff and then started recording his jumbled thoughts. And jumbled and eclectic as they may be, there is undoubtedly an inner strand to the ccalam's narrative. I would like to delve further into the lyrics but at my age the font size on the inner CD booklet gives me a headache! The CD is in fact beautifully packaged and manages to convey the kind of music you might expect, a mixture of spacey calm topped by delightful rhymes that tease out some of the more esoteric meanings. Ccalam conveys an external sense of calm that hides a complex inner turmoil. And it is this duality that carries right through a curious effort that is one part the work of a meandering colourful wordsmith and another part a synth driven musical melange. On the occasions when the two sides meet you get some truly magical moments. However, while 'Watch' does have it's moments from the occasional surprising vocal sweeps and the more introspective vocal delivery on 'Took' to the spacey minimalism of 'It's Only Me' and the soundscapes of 'When I Get Delusions' there is not enough due care and attention paid to the consistency of the vocals to make it that extra bit special. And while ccalam does often carry along his colourful lyrical imagery on the back of a gentle vocal line, there are several moments when he almost sounds like 60's icon Colin Blunstone and then curiously falls short of the mark. Hell, Dylan, can't sing, nor can Keith Richard but they sure know how to phrase. One of his more poignant efforts 'He Thinks of the Sixties' almost makes it, as he cleverly fazes his voice half way through the song, while 'Baby Thinks' has an Indian, almost Steve Hillage style mantra feel to it, as ccalam pulls off a triumph of production over voice. Maybe I am being hypercritical, as there is much to recommend and enjoy on 'Watch'. I'd like to think it is a sense of frustration born of having seen how close ccalam has come to delivering something really special. © 2007 ccalam. All rights reserved.